This year I am hoping to find balance in what I sew: a little cake, a little frosting, and a little unselfish sewing mixed together. These two cardigans were made early December and never photographed, because I sewed more than I ever have in a short space of time. I figured I would get around to taking these pictures eventually. This first Jenna Cardi is made with the hip length version with light pink rib knit and a gold dotted knit from Joann fabrics. The buttons are gold as well. I made it to go with a skirt that is forthcoming. It’s pink plaid in brushed cotton and I can’t wait to make it. Mostly because I have nothing that really goes with the cardi yet. I have a few things that sort of look okay, but not really. I need to sew more pink into my wardrobe in general, because I really love the colour. It’s not just my blog name. The second Jenna Cardi is made from two textured knits from a local store. The cranberry fabric is really disappointing. I originally used it for my test garment for the Natalie Dress, but the seams all puckered and went really weird. The Natalie dress has a lot of detailed seams and it just looked bad with all that puckering. I rarely scrap a garment completely, but that dress just didn’t work out. It looked really good on me, though, and I plan on making another Natalie dress in the future. The white fabric is going to be used for a hoodie in the future. I already have it cut out and ready to go. 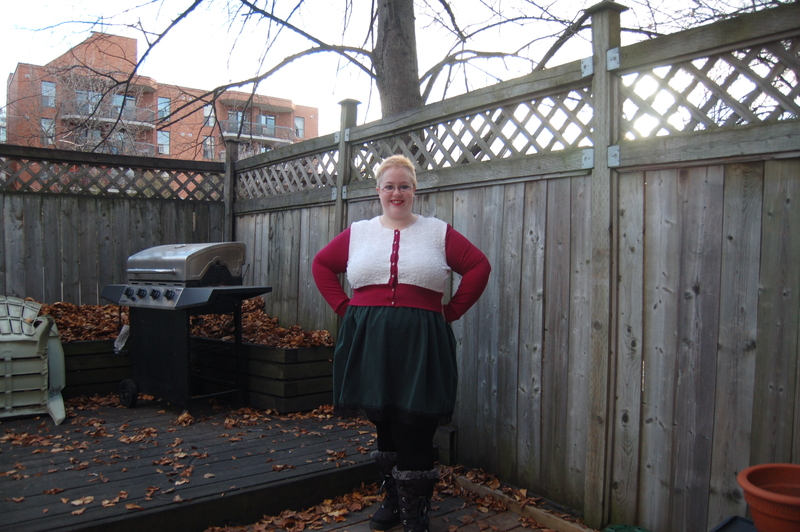 The skirt is from a costume I made two Halloweens ago and I thought it went well with the cardi. Not much else to say about the pattern. 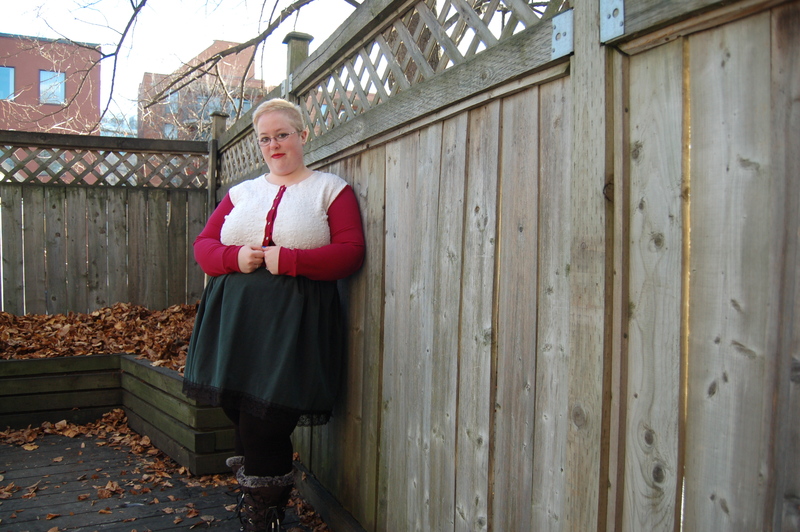 I love it and find it an easy and fast creation, as well as flattering on me in all versions. I’ve made it three times now and will probably make it several more times, because I love it. You are so right about this. It seems to be the sewing cycle. A lot of frosting, followed by a little cake. This year I certainly hope to sew more cake! Very nice. I like the pink one especially well. I love the color pairings!! It’s nice to have some cake with the frosting. 🙂 I made one Jenna cardi, but sadly not for myself yet! I love that cranberry colour, so it’s disappointing the fabric isn’t so good. The Jenna cardi looks like a really nice pattern, too. Thanks, Rowena! Yeah, the quality was so upsetting, because I love the cranberry colour. Also, the texture is so pretty. It doesn’t show up very well on the close-up picture, but it’s little scallops. I highly recommend the pattern. It’s such a quick sew and diverse pattern. So many options. 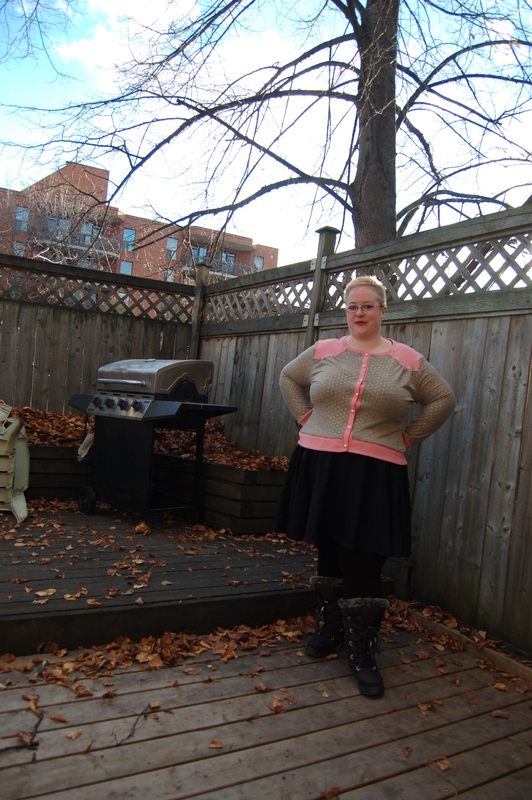 I love the pink and gold dot cardi – the colour pairing is perfect! Really nice job on both. I love the sparkles. So pretty. Great interpretations of the Jenna card. Thanks so much, Janet! 😀 I love how versatile the Jenna Cardi is and how you can create so many combinations of colours. Very pretty! The pink is my favorite. I won the Jenna cardi pattern in a blog giveaway, so seeing your examples is inspiring me.